Many luggage companies have been following a recent trend of somewhat overcomplicating their luggage sets with too many pieces; not only does this often make a set more expensive, but it can leave travelers with a non-essential suitcase they never end up needing or using. 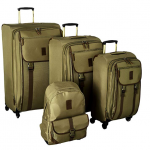 Atlantic Luggage sets are a pretty smart choice because this company rarely goes over three options for a set, and with their Avion Lite bags in particular you get two fantastic business-formal pieces at 26 inches and 22 inches. 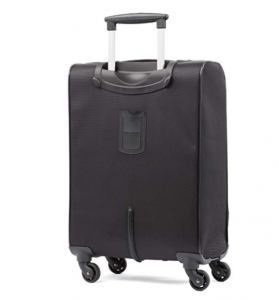 ‘Uncomplicated’ is a word which Atlantic’s luggage brand is great at understanding, their luggage is designed to be stress free with smooth gliding wheels, rugged durable fabrics, and interiors with plenty of organizing options. Since 1919 Atlantic Luggage has fixed their sites on creating suitcases which are highly affordable, lightweight, and made more valuable by their long-lasting materials engineered with tough honeycomb frames. 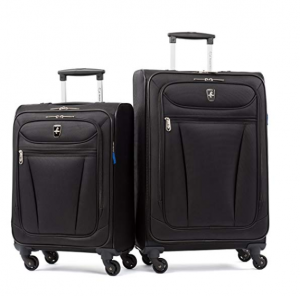 With their brand mission in mind, let’s take a further look at Atlantic Luggage’s Avion Lite 2-Piece Spinner Collection. “Stress-free lightweight travel at it’s best.” That is part of Atlantics mission plan, and it’s a design goal which has gone straight into every aspect of this collection. The Atlantic Luggage Avion set design features two bags which are very lightweight and clearly woven with durable honeycomb texturing, these bags include a 22-inch carry-on rigorously tested to fit the standards for national and international overhead containers, as well as a 26-inch checked bag size which beats those overlarge suitcases at 28 and 30 inches while also offering expandability for plenty more space. Suitcases in this set include multidirectional 360-degree spinner wheels, highly organized interiors, extra exterior pockets, and close to every other design feature Atlantic could fit while still keeping their professional luggage affordable for the average coach traveler. With a 26-inch suitcase being the largest item in a collection many travelers tend to look elsewhere, this is because most 26-inch suitcases can’t compete with equally priced 28 inchers. Don’t be fooled, at only 26-inches this suitcase offers 105 liters of packing space; however, once fully expanded it allows up to 120 liters no problem (that’s equal the packing space of a 28-inch suitcase for less weight, less cost, and less hassle). Also, it’s just the first example of how these bags can expand up to 2-inches wider for 15% more packing; the 22-inch carry-on is quite ideal for weekenders and even up to 3-day trips on its own, capable of 65 liters expanded. Of course, other storage space is offered in the form of two front zippered pockets, interior tie down straps, and an inside zippered mesh pocket for keeping your pressed shirts from wrinkling.  No kind of toiletry kit is offered, which is a shame because it does somewhat lower the value of the brand when compared to products like competitor brand Delsey’s Paris Delsey Luggage Cruise Lite Softside Expandable Spinner. Atlantic Luggage sets try to include all the stops, for their Avion Lite collection they went above and beyond the call of duty by not only providing top materials but also a design which stitched them together with added padding. 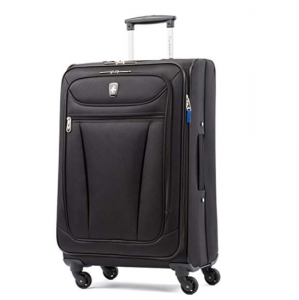 What’s more, this suitcase includes 360-spinner wheels for ease of travel and quick motion in busy airports, and a telescopic handle to make your travels more of a breeze; each handle locks in place and then retracts with the touch of a button. 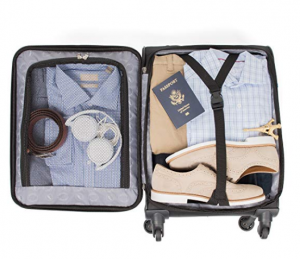 Bot suitcases feature dual outer pockets, a small back insert for your details, and a slick interior which is ideal for organizing your shoes or your pressed shirts. Interior features offer a watertight lining, tie-down straps for your clothes, and a separate zippered mesh pocket for extra organization and a little extra stretch for however you pack it. Each case also features rugged skid guard and corner guard protection of high wear points. The importance of lightweight luggage for travel cannot be stressed enough and is clearly the main priority when it comes to an Atlantic luggage set design; sure, at a glance these bags look like they might be quite light, but it’s the materials which truly prove their travel potential. Suitcases in this set are made from durable polyester fabric – one of the lighter materials compared to some cotton canvas and nylon designs – and the material allows a 26-inch suitcase to weigh in at a measly 7.4 pounds unpacked and a 22-inch carry-on to beat all airline requirements at only 6.1 pounds unpacked. All the rest of the weight concerns are up to you, your airline, and how you pack. At only 7.4 pounds the checked bag should be very easy to pack while still avoiding the typical 50-pound mark imposed by most national and international flights. Additionally, your carry-on item will easily fly under the radar and is designed to fit comfortably in overhead bins on all flights; for crowded flights where there is no room, you may have to check your bag at the gate, but don’t worry this shouldn’t incur any extra fees. Sacrificing some durability for lightweight luggage that helps travelers avoid extra handling fees is a common practice which typically has no drawbacks. Certainly, suitcases which use nylon and cotton canvas materials are going to be more durable than brands and set’s which employ polyester. However, Atlantic has done its best to counter the less durable polyester materials in their design with unique engineering that weaves the polyester in a highly durable honeycomb shape that not only makes tears and rips less likely, but also further protects your belongings with an additional outer layer of padding. Atlantic isn’t the only company to create luggage this way, for instance AmazonBasics has a set quite similar to the one under review, it their Premium Upright Expandable Softside with TSA Locks. Other durability features include thin aluminum contouring to help the suitcase keep its shape, along with an interior watertight lining; all outer features are treated in a water-repellent coating. Atlantic Luggage sets use ergonomic high tensile strength zipper pulls on all their products, and these provide effortless and secure opening and closing of all exterior pockets. Finally, compared to in-line skate wheels this set’s spinner wheels are a bit on the weak side, but this has more to do with them being riveted to the suitcase bottom rather than screwed into place. Style options are somewhat limited to the single color; however Atlantic Luggage does make non-set lite bags with different color schemes, like their Ultra Lite Softside Carry-On Expanders. For the Avion Lite in black however, and with the honeycomb texturing, the look is quite appealing. With any suitcase from the Avion Lite collection you’ll look the model of professional travel; these suitcases reflect a expert style which is accentuated by their silver zippered siding, slick retractable handle, and embossed Atlantic brand logo. Also, wherever you go these suitcases will roll quickly and expertly in and out of traffic – even down busy city streets – and where walking shows as much about a person’s character and style, with such exact motion wheels there are no better suitcases. This simple two-piece set includes a checked bag which measures in at 26x16x11 inches, and a carry-on which measures in at 22x14x9 inches. At these sizes this set easily meets and surpasses any size or weight restriction your particular flight will require, additionally both suitcases offer up to 2 additional inches of packing space – though take care how you pack – and traveling together they offer enough space for a 2 to 3-week trip. You can even pack your belongings without expanding either suitcase and then save the zippered expansions for anything you might pick up on your adventure. 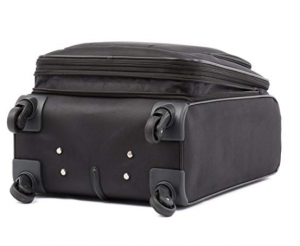 Atlantic Luggage ensures that all their products are backed by a superior manufacturing warranty, this warranty covers everything from their luggage to their garment bags and totes. The Avion Lite Collection is covered by this warranty for up to 10 years limited, and for any manufacturing defects or damages incurred during shipping, Atlantic will either repair or replace whole suitcases or parts of suitcases. For damages resulting from neglect, misuse, or airline mishandling, all repairs and/or replacements are left to the discretion of the owner. For further warranty details contact Atlantic and provide your receipt as proof of purchase, otherwise contact the distributor for more information. Atlantic Luggage is a savvy brand which puts its customers first by designing suitcases which are very affordable and extremely lightweight; not only will these bags save you money straight from the initial purchase, but they’ll also help you skate under the additional fees every travel is paying except for you. Atlantic Luggage Avion Lite collection in particular features a unique design which is lightweight but also quite durable, cheap but also an investment backed by a 10-year warranty. This collection features two fantastic bags, a 26-inch checked, and a 22-inch carry-on, both of which strike a certain elegance meant for any professional traveler making his way to the next destination on the map. Engineering ensures both bags in this set will match all national and international weight and size requirements. Polyester materials feature a unique honeycomb stitching for extra durability. Zippered expansions offer up to 15% more packing space. Polyester isn’t as durable as cotton canvas or nylon. Wheels are riveted rather than screwed.